If you should ever find yourself over-annoyed by corporate America 's relentless blizzard of advertising, product placement and ubiquitous branding at the expense of scenery and sanity, relief could be as close as your local theatre. 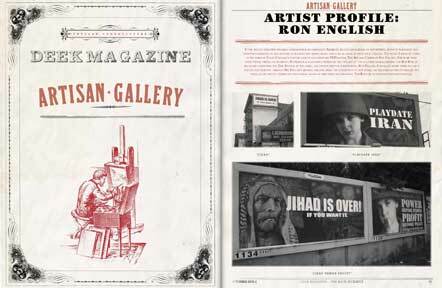 The relief I speak of comes in the form of Pedro Carvajal's feature length documentary POPaganda: The Art and Crimes of Ron English. 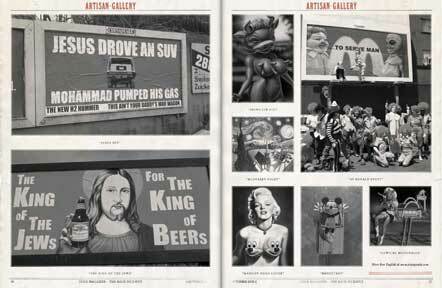 Far more than your typical profile of an artist, Popaganda is a colorful primer on the fine art of the cultural hijack,starring the Bob Ross of billboard liberation, the Evil Kneival of the easel, the patron saint of subvertizing, Ron English. Carvajal's movie takes you on a step by step sojourn through Mr. English's artistic process, from the conception of new ideas, the techniques used to realize the ideas, to the often unexpected and illegal modes of displaying his creations. The R rating is for revolutionary content.